Botox is a prescribed medication made of botulinum toxin produced by Clostridium botulinum. Botox functions by blocking the neuromuscular transmission through decreased acetylcholine release. This temporarily paralyzes the injected muscle and weakens it. When Botox is used for cosmetic purposes, only a small dosage is injected to prevent any adverse effects. Botox was approved by the FDA in 2002 to temporarily treat moderate to severe frown lines between the eyebrows. The regions for Botox treatments have expanded from frown lines to the frontalis (forehead region), mentalis (chin region), crow’s feet (eye regions), nasalis (nose region), and masseter (jaw muscle). Botox is a non-invasive method with proven effects. The procedure is simple and short, and does not cause a lot of pain. Because of these characteristics, Botox injections are also labeled a ‘3S’ (simple, safe, and satisfactory) procedure. The effects of Botox will start to appear 2-3 days after the injection, but it will take about 1 week before maximum effects are noticeable. Effects will last for 3-6 months, but vary individually. Patients will decide to receive the injection again when fine lines reappear. The effects of Botox will start to appear 2 weeks after the injection, and will take about 6-8 weeks before maximum effects are noticeable. The effects of the procedure will last for 3-6 months but vary individually. Patients will decide upon retouching the injection again in 4-6 months, and the Botox effects will last longer after multiple injections. The aging process reduces the amount of collagen and hyaluronic acid in our skin, which causes deep lines and a reduced volume in the face. Fillers are injectable materials that can fill deep lines and increase volume in certain areas. Fillers are injected underneath the soft tissue of the face and patients will see difference in their face immediately. 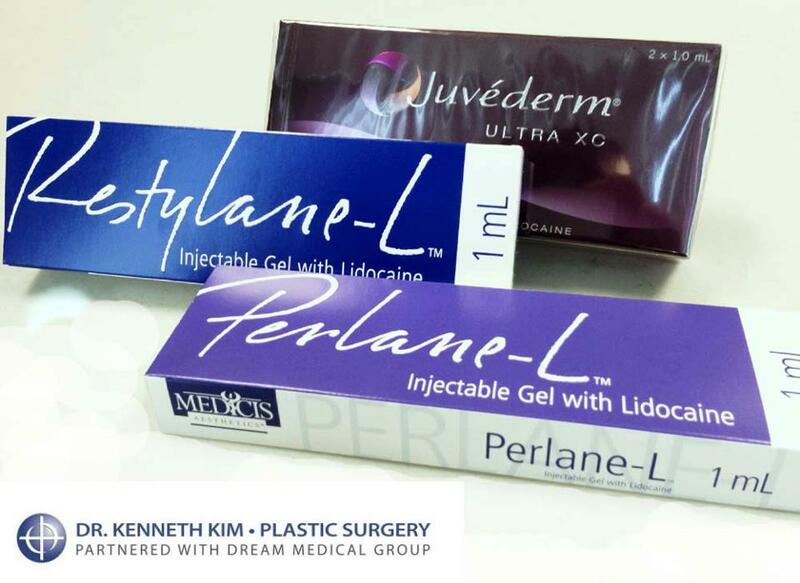 The fillers provided by Dr. Kenneth Kim are Restylane, Perlane, and Juvederm. Restylane and Perlane are FDA-approved fillers that are widely utilized across the world. Restylane and Perlane will not only fill your deep lines, but can also heighten the nose and increase volume in various areas of the face. The duration of the injection is short, but patients will see results immediately after the procedure. The injection contains lidocaine (local anesthesia), thus minimizing pain during and after the procedure. Juvederm is a FDA-approved, gel-type filler often utilized in removing “smile lines” from the corners of the nose to the corners of the mouth and scars. Juvederm is also often utilized in lip augmentation. It contains lidocaine (local anesthesia), thus minimizing the pain during and after the procedure. There are no special instructions before the procedure. Make-up will be removed at the injection site before the injection. You may have some swelling, bruising, or itchiness immediately after the procedure, but it will naturally disappear. Avoid contact with water and make-up 1-2 hours after the injection. Avoid hot temperatures, sauna, or strenuous exercises 7 days after the injection.